Every morning, Kamla Devi offers water to the tulsi plant in her courtyard. On Mondays, she trudges downhill to worship a giant banyan tree in Sumari, a mountain village about 175 km from Dehradun. When asked about the rituals, Devi says, “It gives me peace of mind. I have grown up watching my mother and grandmother do the same.” Unlike the tulsi which is found in Hindu homes, the banyan is a village property. Almost in every Indian village, people share a deep attachment with this tree. The banyan at Sumari has crystal clear water flowing near its roots. It is considered sacred, as its source is associated with the village deity. After marriages are solemnised, new brides are welcomed at this spot. They perform puja in the presence of the priest. Like Sumari, residents of Lupunguttu village in Jharkhand’s West Singhbhum district also revere a grove where natural springs flow out of tree roots. People believe that the water has therapeutic properties. 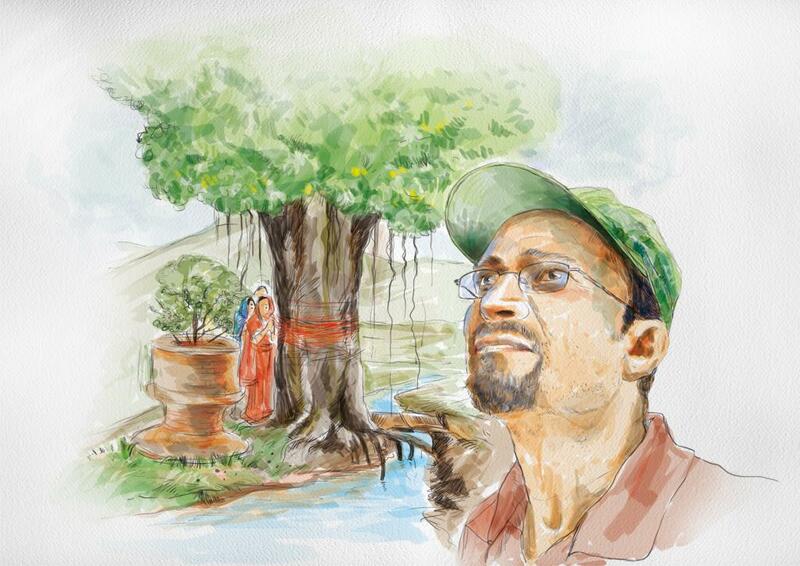 “The water could be deriving its therapeutic property from Arjuna trees (Terminalia arjuna) that dominate the grove,” says Manisha Toppo, post-graduate student at the Bhopal-based Indian Institute of Forest Management. Whatever be the reason, tree worshipping signifies human association with nature. There are sacred species, sacred groves and sacred landscapes all around us. Spiritual ecology, through which human beings connect themselves with the cosmos, has evolved over time. Today, it is an emerging idea in ecological conservation. Growing interest in this concept may help address environmental issues. Trees are intrinsically connected with Hinduism and felling them is generally discouraged. Even Ayurveda practitioners are advised to perform special rituals before gathering plants for treatment of diseases. Many medicinal trees and plants are considered sacred, symbolising deities. For instance, brahmakamal (Saussurea obvallata), peepal (Ficus religiosa), bargad (Ficus benghalensis), Bael (Aegle marmelos), tejbal (Zanthoxylum armatum) and tulsi (Ocimum sanctum) are considered sacred in Hinduism. Bael is an important species and used to prepare medicines in India. It is also used to make drinks and jam. Since it is used on a number of occasions, its overexploitation may endanger this species. This may have compelled people to associate it with Lord Shiva to ensure that devotees revere it. Over the years, offering bael leaves to Shiva has become an important ritual. There is a similar reason as to why rudraksha (Elaeocarpus sp) symbolises Rudra, another name for Shiva. Tejbal is also associated with Shiva. Hindus believe tejbal wood-sticks keep away impure air and evil spirits. Different parts of bargad are associated with the Hindu triumvirate. The branches symbolise Shiva, the bark Vishnu and the roots stand for Brahma. Similarly, kadamba is associated with Lord Krishna, who is depicted as playing flute under its shade. Saraca indica, or the Ashoka, has medicinal uses and is considered pious in both Hinduism and Buddhism. Even the coconut tree is important, the fruit being widely used in Hindu auspicious ceremonies. Ban tulsi (Origanum vulgare), which grows in and around the Badrinath valley, enjoys special status as it is offered to Lord Badrinath. Collection of Brahmakamal, which grows above 3,800 metres in the Himalayas, is restricted to a few days. To keep many species intact, traditional healers avoid disclosing their medicinal properties. While transferring knowledge to the next generation, healers often make their disciples take oath regarding misuse of knowledge. Besides conserving individual tree species, indigenous communities have marked forested areas associated with deities, spirits, rituals and taboos in many places. Such places, known as sacred groves, are the live manifestations of historical, cultural and emotional attachment of man with forests. Sacred groves are found across the country, ranging from a few square metres to several hectares. They are known as devray in Maharashtra, devarkand and siddarvanam in Karnataka, oraans, kenkari and malvan in Rajasthan, saran in Chhattisgarh, and jaherthan in Jharkhand. For indigenous communities, such patches are often situated in the vicinity of villages. This helps in conserving species’ diversity across different ecosystems. Sacred groves also harbour many threatened plants, trees and animals. In Kodagu of the Western Ghats, threatened tree species such as Actinodaphne lawsonii, Hopea ponga, Madhuca neriifolia and Syzygium zeylanicum are restricted to sacred groves, along with the presence of birds and microfungi. A 2005 study published in the journal, Ecology and Society, authored by S A Bhagwat et al points out that traditional rules prohibiting felling of trees and killing of animals in groves have helped preserve their biodiversity. Forests also hold special significance for indigenous communities. Such an attitude stems from the belief that they provide power to deities. In some communities, the power of the deity is brought to the village temple through various rituals at the time of festivals. Once festivities are over, the same power is returned to the forest by performing specific rituals. Author M K Mishra mentions this in an article published in the journal, Language & Ecology, in 2009. Sacred groves not only unite communities spiritually, culturally and socially, but also create space for festivals and social events. In many cases, the idea of preservation is not limited to specific forest patches only. Traditionally, communities have also revered mountain peaks and wildernesses. Consider the Himalayas. Since time immemorial, it has been a pilgrimage spot for devotees. Many Himalayan peaks such as Kailash, Nanda Devi, Neelkanth, Trishul, Gaura and Om are worshipped as deities. As they are considered sacred, landscapes surrounding such peaks support rich biodiversity. The Nanda Devi Raj Jat, which is celebrated every 12 years, is a combination of a revered pilgrimage and festival held in Chamoli, Almora and Pithoragarh in Uttarakhand. The pilgrimage starts from Nauti village near Karnprayag, goes through a number of villages and finally reaches Roopkund and Homkund with a four-horned ram. Nanda’s Chhatoli, or the deity’s umbrella, is made up of ringal (a local dwarf bamboo species called Thamnocalamus spathiflorus scientifically). This spreads the idea of respecting animals, trees and the environment among people. In the same spirit, Himalayan lakes like Hemkund, Kakbhusandi, Nandi Kund, Mansarovar and Mansar are considered sacred. The Ganga, which originates from Gaumukh in the Himalayas, covers a long distance. All the places it flows through are also considered sacred. Many cultural activities are aimed at conservation of seeds. Festivals such as the Bihu in Assam, Baisakhi in Punjab and Pongal in Tamil Nadu are associated with either sowing of seeds or harvesting. Often, seed selection is conducted traditionally. For instance, in Sumari, people collect soil from nearby farms and keep it at a corner of their rooms. They sow barley seeds in this soil on the first day of Navratra during October-November. As a mark of respect, every day they sprinkle water over it and offer prayers. This continues till the last day of Navratra when the seedlings are uprooted amid the chanting of mantras. Finally, they are used to make garlands and offered to the village deity or used in religious functions. This has helped conserve seeds through generations and maintain agro-biodiversity. Realising the significance of spiritual ecology, the environment ministry has incorporated the “maintenance and enhancement of social, economic, cultural and spiritual benefits” as one of the eight criterion in the National Working Plan Code for determining sustainable management of forests. In the era of climate change, it is necessary to explore ways to preserve natural resources for posterity. Long-established beliefs may go a long way in saving the planet from destruction. Chandra Prakash Kala teaches ecology and environment management at the Indian Institute of Forest Management in Bhopal. "Pre-Independence India did better conservation"